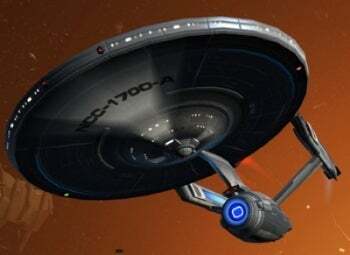 Care to take your very own Federation starship for a spin and maybe right a few of the wrongs done by Paramount writers to the franchise over the past decade or two? The thought of beaming down to planets and playing World-of-Away-Team-Craft have you grinning from pointed latex ear-to-ear? Has the new Star Trek MMO got a deal for you! If you're too impatient to wait for Star Trek Online's planned early February launch, you can beam onboard a few weeks early to give the game a shake in open beta. Developer Cryptic Studios just announced the beta will run from January 12 to January 26 next year, with keys handed out on a first-come, first-served basis. Note that while the press release claims you can access the open beta by hitting the official site, www.startrekonline.com, but you'll have to click the "closed beta" link to hit the preview application page. Cryptic's angle on Star Trek, for those of you with honorary PhDs in Cultural Trekology, takes place in the year 2409, which according to the official site, occurs during the "prime" timeline after Spock tangoes with the singularity in the recent film. Each player will captain his or her own ship, but patrolling the hygienic highways and byways of your customizable star-bound vessel won't be an option until sometime after launch. You can initially sign up for Starfleet or the Klingon Defense Force, with plans to add additional races down the road. You'll also be able to custom-roll your own species, though that still sounds like a non sequitur to me. If a couple million people sign up and half of those elect to gin up new interstellar strains from scratch, you'll get roughly a million trifling (presumably bipedal) riffs, diluting the diversity pool to the point of calling attention to the design tool's limitations. Then again, what do I know. After all, we're talking about a franchise whose principal aliens--funky looking brows, hairstyles, freckles, and ears notwithstanding--tend to have two eyes, one nose, one mouth, two arms, and two legs. Care to read more? Check out the official FAQ, as well as the "Everything we know about STO" thread on the game's official forums.